I got to take photos of some friends this weekend and I really liked how this one turned out. 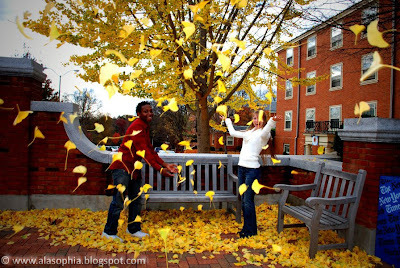 When they threw the leaves up they blew straight at me! I wish the one leaf wasn't hiding her face, but I can still see her smile! In retrospect, this is a situation in which I should have used the continuous shutter release to capture the best possible moment. Gotta keep practicing. Wow, it really looks like Fall there. I'm jealous. ashley - it is right on the cusp of winter though -- all the leaves have changed and they are halfway off of the trees.